The Dubai Police General Command has joined the United Nations, UN, Global Compact to support the international efforts to achieve sustainable development, as the first international police authority to officially join the compact by adopting its ten principles, to affirm the support of the Dubai Police for human rights, minimum working standards, combating corruption and preserving the environment, which will help to achieve the security, safety and happiness of the entire community, UAE national news agency WAM reported. Major General Abdullah Khalifa Al Marri, Commander-in-Chief of the Dubai Police, received Mahmoud Al Burai, UAE and MENA Representative of the Global Compact Network, who presented the official letter that confirms the membership of the Dubai Police General Command in the compact, with the attendance of Colonel Dr. Tamim Mohammed Al Haj, Director of the Environment, Health and Safety Department at the General Administration of Services and Equipment. Al Marri affirmed the desire of the Dubai Police General Command to consolidate the community’s security and safety and keep pace with the best international practices, to develop a sustainable police security authority, in line with the vision of the Vice President, Prime Minister and Ruler of Dubai, His Highness Sheikh Mohammed bin Rashid Al Maktoum. He added that sustainable development is driven by the country’s local and international strategies and visions, most notably the UAE Vision 2021, the Dubai Plan 2021, the UAE Centennial 2071, and the Green Economy for Sustainable Development, as well as by the country’s 17 sustainable development goals, in cooperation with government and private sectors. Al Marri noted that the Dubai Police General Command launched the “Sustainable Development Roadmap 2030,” which aims to realize the goal of creating a sustainable police security authority that works in the areas of society, the economy and the environment, to guarantee human rights and create an ideal work environment, which is encouraging for the employees of the Dubai Police, as well as happiness of the community of Dubai. 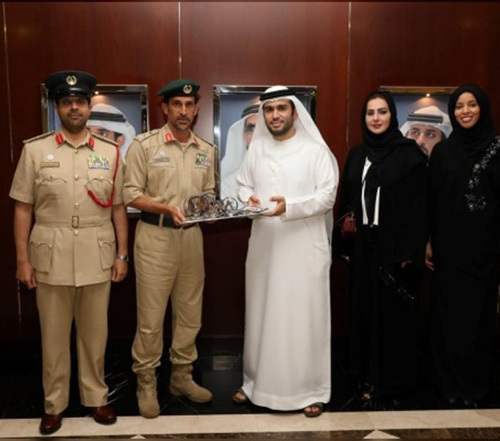 Al Burai said that the membership of the Dubai Police in the compact provides opportunities for local and international cooperation between various business sectors and government and private organizations on sensitive issues while establishing a communication platform where the community can obtain information from the UN about development causes, as well as exchange expertise and best practices to create solutions and practical strategies for the security sector.